A useful shower favor and it is already nicely wrapped. I did, however, change out the heart tag that came with it and attached another heart tag with the Bride and Groom's name and wedding date. Made a very nice gift and I received lots of compliments on them. A great 80th Birthday Party Favor! Wrapped in a lovely box with a beautiful bow, it was a great accent piece at each place setting on the table. The favor made a huge impression on guests. Everyone kept theirs and took them home. It's a great keepsake. 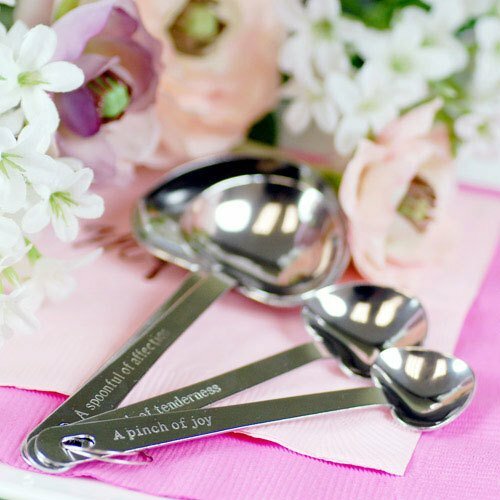 Each time the spoons are used, your guests will remember the occasion and the guest of honor. I am and have used them for housewarming gifts. and put them with my baked goods. this was the most appropriate gift of appreciation to friends that were kind to me during my illness because they brought food for me. This was the perfect Valentine gift for my soon to be wife of my grandson. So all of the things she cooks for him will be made with LOVE spoons!!! Not just for measuring anymore! We used these to decorate a Christmas tree during Advent at our church. Our theme was "Stirring up Advent in our Hearts". We had a recipe for Advent banner with the words Love, Joy, Hope and Generosity on it. After Christmas, each family took a measuring spoon home to hang on their own tree. The spoons were perfect! and Reasonable! So glad I found you. The packaging was great too! Dimensions: Spoons: 5.75"L x 2.25"W; Gift Box: 6.5"L x 2.75"W x 1"H.
A charming favor idea for your event, this set of heart shaped measuring spoons is designed with the host in mind. Four clever phrases (A heap of love, A spoonful of affection, A dash of tenderness, A pinch of joy) are engraved on the handle of each measuring spoon. The traditional measurements (1/4 teaspoon, 1/2 teaspoon, 1 teaspoon, 1 tablespoon) are engraved on the back side of the handle. Heart shaped spoons are made of stainless steel and thus, will not tarnish over time. This is a lovely keepsake that your guests will be able to use, and think of your special event, for years to come. Each set of spoons is packaged in a classy black gift box with black velvet lining and clear lid. Gift box is accented with white organza bow and removable gift tag that reads "Love Beyond Measure." Measuring spoons are approximately 5.75"L x 2.25"W and the gift box measures 6.5"L x 2.75"W.